English-based Mandarin loanwords are commonly used in Chinese people’s daily lives. 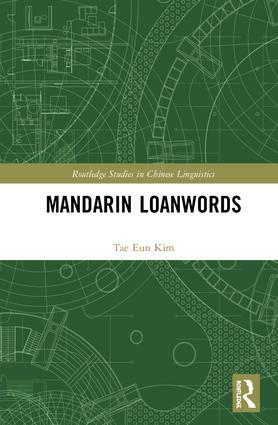 Mandarin Loanwords demonstrates how English phonemes map into Mandarin phonemes through Mandarin loanwords adaptation. The consonantal adaptations are the most important in the analyses, and vowel adaptation and tonal adaptation is also considered. Through the analysis, it is proven that the functions of phonology and phonetics play a significant role in Mandarin loanword adaptation, however the functions of other factors, such as semantic functions of Chinese characters and English orthography, are also discussed. Additionally, the phonetic symbolization of Chinese characters is mentioned. Tae Eun Kim is an Assistant Professor in the Institute of Language and Information Studies at Yonsei University in Seoul, Korea. She received her Master’s degree from Ewha Womans University in Seoul, Korea in 2002, and earned another Master’s degree from University of Wisconsin-Madison in the United States in 2009 and her Ph.D. in 2012. Her research interests are Chinese phonology, Chinese phonetics, Chinese lexicology, and Chinese pedagogy.